Brazilian oil lines extend over 20,000 km and in this way the use of inspection means to guarantee pipe integrity is very important. The use of intelligent pigs has greatly increased so as to measure pipe wall thickness and to indicate locations with wall thinning caused by corrosion. The majority of inspection has been made with magnetic pigs. These devices are quite good to localize corrosion points but not so far to measure the wall thinning precisely. This way the local ultrasonic wall thickness measuring is very interesting. In this paper the evaluation of corroded areas in oil pipelines is shown These areas are pointed out by magnetic pigs mainly by ultrasonic automatic and semi-automatic corrosion mapping system. The differences between both techniques (pig and automatic ultrasonic devices), advantages and drawback of each one are commented. The use of Instrumented pigs to evaluate corrosion damages on oil lines has grown in Brazil in the last tem years. 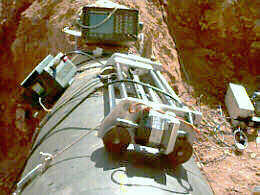 However, the majority of non-destructive devices used to inspect pipelines employ magnetic sensors. It is well known that these sensors have some limitations to precisely determine corrosion pits depths. Besides this drawback, pig inspection is extremely valuable to choose or focalize the most critic pipeline areas but requires another non-destructive technique (NDT) to measure thicknes or certify wall losses. Normally the other NDT is the ultrasonic technique. But in spite of field environment toughness and difficulty to access critical pipelines areas portable thickens gages devices are preferably used. However these devices are very simple and do not allow differences to be seen between laminar discontinuities and corrosion pits, causing misunderstandings on pig results. In the work described in this paper we have used automatic and semi-automatic ultrasonic systems to evaluate regions indicated by pig inspection. Table I presents in a resumed way characteristics of the pig inspected pipe. The inspections on the cited pipelines were carried out by means of tools known as intelligent or instrumented pigs. These devices could be of different types but their feature is measuring and recording wall thickness along pipe length. These data stored will be used to analyze pipe integrity. In this paper three types of pigs belonging to four companies were used: conventional magnetic (CMA, CMB, CMC, CMD), high-resolution magnetic (higher number of sensors, HRM) and ultrasonic (UT). 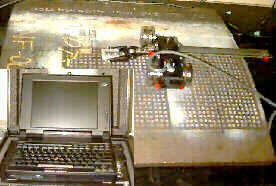 Photo 1: Semi-automatic ultrasonic inspection system NB-2000 by AIS. In semi-automatic inspection we applied the system NB-2000 from AIS-Automated Inspection System Inc., using MSEB5 Krautkramer probe, 8mm diameter, 5MHz (photo 1). In automatic inspection we applied digital ultrasonic devices models USD-10 and USD-15 from Krautkramer, Epoch II and III from Panametrics; and MSEB4 Krautkramer probe, 14mm diameter, 4MHz. The automatic system, developed by this paper authors basically is a software (USAquis) that runs in IBM PC compatible under Windows 98 environment, and a automatic probe holder scanner, photo 2. Photo 2 : Automatic ultrasonic inspection system by CENPES/PETROBRAS. Normally the results of pipeline PIG inspection present the point (location) of pipe extension where damages are located. These longitudinal positions are linked to pipe accidents (valves, deviations, etc) or pig inspection marks (reference magnets). Other flaw characteristics are given like position on pipe perimeter; extent (length); width and; mainly depth (wall loss). To illustrate automatic ultrasonic result presentation some data collected from ultrasonic inspection along pipelines cited in 2.1. are shown. These results are graphically presented and known as corrosion mapping (C-Scan presentations), on those, corrosion depths are correlated to a color scale. The color scaled use in this paper is presented in table II. Figures 1 and 2 present for illustration purposes automatic ultrasonic results along pipeline points assigned by pig inspection. In these pictures, C-Scan (corrosion mapping) and; B, D and A-Scan (minimum wall thickness point) presentations are shown. Table III, shows data comparing Intelligent pig and Automatic Ultrasonic inspection results. We consider the maximum wall loss from each point in order to compare both techniques because this parameter is the most relevant to pipeline integrity. To easy results comparisons dates from Table III are presented in a graphic (figure 3). Roughly half of comparisons pig "versus" ultrasonic are in + 10% error range. This paper does not intendtion to be a definitive reference about this subject, but in fact point out some aspects related to the use of the inspection tools cited. Instrumented pigs for sure represents a powerful resource to oil pipeline evaluation related to safety aspects. They enable pipeline integrity condition to be assess in a short time and at a reasonable cost, compared with another localized (focused) ndt techniques. However use of them should be made with some care because we have also seen that complex tools (high resolution magnetic and ultrasonic) have some drawbacks when compared with more focused techniques. We consider localized ultrasonic technique mainly when applied in an automatic or semi-automatic way, as in this paper, to be more precise to discontinuities dimensioning than an intelligent pig. However localized ultrasonic is not practical to be applied along the complete pipeline. So, we recommend use of automatic ultrasonic only to verify and/or certify locals pointed by pig inspection.